Campaigners are demanding an apology from a weekly newspaper which published a “disgraceful” four-page wraparound advertising the Conservative Party. The Hastings Observer was one of a number of regional newspapers to publish the wrap on the front of the title just days before the election, in a move which caused a political storm. Now a petition calling for an apology from the weekly for “prostituting” its front page has been started on the website Change.org and so far been signed by more than 1,100 people. 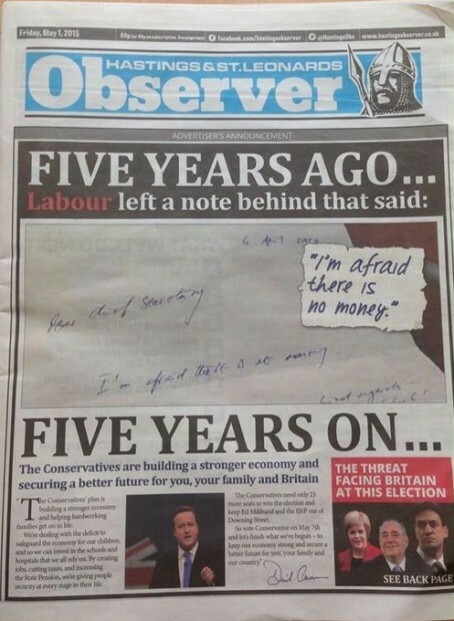 The Observer was one of seven Johnston Press newspapers to publish the Conservative wrap featuring a message from Prime Minister David Cameron, which carried a small strapline denoting it as an ‘advertiser’s announcement’. The title also published a piece inside the paper by editor-in-chief Gary Shipton, explaining the use of the advert and stressing that the Observer did not support any political party. Among the other newspapers to to publish the wrap were the Lancaster Guardian, Eastbourne Herald and Local World title the Lincolnshire Echo, which insisted on a larger notice depicting it as an advert. Other regional papers have also published wraparounds from political parties, including The Wirral Globe, which featured a Labour Party advert last week. Matt Cornish, former editor of the Daventry Express and Craven Herald, described the wrap as “inexcusable” on Twitter and said he would have refused to run it if he was editor of the Observer, because it looked like a real front page. Following complaints on social media about the wrap, the Observer has published a piece in response in which Gary said the Conservative Party was able to purchase the advertising space in the same way as any other advertiser. He wrote: “Had a similar request been received from any other lawful political party they too would have been entitled to purchase the advertisement on the same terms and conditions. “Indeed, other parties have purchased wraps in other parts of the country and this particular advertisement appeared in a similar format in other newspapers published both by ourselves and other companies. “We did insist that the advertisement feature was clearly labelled as such, not least because the artwork provided to us had been given an ‘editorial’ look by the political party. “In addition, we inserted a prominent article within the main paper making clear that this was an advertisement and that its acceptance did not imply that we endorsed either the party or the message. A spokeswoman for Johnston Press said: “A number of our titles ran a paid-for piece of advertising for the Conservative Party last week. “The wrap was clearly labelled as advertising and, in the case of the Hastings Observer, it was made clear in a prominent story inside the paper that the title is editorially independent and supports no party. The mistake was to allow the ad to mimic the paper’s front page. Rather than a wraparound it should only have been accepted as an insert. I guess that the decision was influenced by the state of the newspaper industry. It seems almost anything is acceptable these days, provided it makes money. No-one cares. All this amounts to is grandstanding by vested interests at the tail end of a lacklustre general election campaign. I care and i believe it is wrong for a newspaper to do this. Have as many political wraparounds as you like – just don’t make them look like actual newspaper content. Judging from the number who have now signed this petition, the next ABC figures for the Hastings Observer should be interesting. Typical of the left to try and silence something they do not like. Do we/they think readers are so stupid they cannot tell the difference between an advert and news? Is it coincidence that the Johnston Press flagship title in Yorkshire (the Yorkshire Post) has recently come out in support of the Conservative party? Maybe JP will be turning all their mastheads blue tomorrow. These papers aren’t paid for by your council tax bill you know, they can do what they want. Are we to assume Matt Cornish would have fallen on his sword when the MD overruled his “I refuse to publish” line – as would inevitably have happened? As mentioned elsewhere on this site, the Halesowen News has carried seven four-page wraparounds for the Tory MP now candidate in the last six months. Here’s what its editor (sitting in distant Worcester) says on the website: ” We believe our readers are well aware of the difference between advertising and editorial, but, for the purposes of clarity, the advertisement appearing on the news page in support of the Conservative candidate in the general election is, exactly that, a paid advertisement. The fact the editor feels the need to spell this out surely shows the risks involved? A long time ago the the battle of Hastings decided who ran the country but I’m not sure that it will this time and it seems the weevers are getting the money before the event rather than after! The Lincolnshire Echo carried the wrap-around last week. The Editor confirmed to me that it was indeed a business deal. I haven’t got a problem with that although I did say to him that it might have been construed as offering support for the Conservatives by some people, which wouldn’t do his newspaper’s claim of impartiality much good. Johnston Press editors toe the party line (literally) if they want to hang on to their jobs. I predict a knighthood for Highfield from the grateful Tories. There is a significant difference between an advertising customer who sells a product or service sponsoring a wrap on a paid for newspaper and a political party. The role of an independent and local paid for newspaper is to hold politicians to account and readers pay the cover price of the paper for this service. When a paid for title accepts sponsored content on its front page, readers are being deliberately misled – that’s why the politicians will pay the premium rate to get access to the front page. They know that, despite what the editor quoted in this piece states, readers will not understand that this isn’t impartial editorial coverage. I think it’s wrong. I think the newspaper has let down its readers and it’s credibility has been undermined. Great idea – better than that news rubbish my editors normally say they want to put on there front pages. Could have been a lot worse if it had been native content – too much fuss about nothing! So, a newspaper’s integrity destroyed at a stroke for a fast buck. Feel sorry for Hastings Observer content editor Sheena Campbell, landed with a travesty of decision making by the suits upstairs in only her third week in the job. Aw, come on. We all know that JP would accept the devil’s dollar, should North Korea offer them the bounty of a wrap-around. The Independent Press Standards Organisation doesn’t deal with complaints about advertising. IPSO’s website refers complainants about ads to the sector regulator, the Advertising Standards Authority. The ASA states political ads are outside its remit. So there’s one rule for general advertisers, and, er, no rules for party political ads. The Hastings & St Leonards Observer wraparound was not only formatted in ‘editorial style'; it so closely resembled the paper’s usual splash layout and typefaces you’d be forgiven for surmising Observer subs had knocked it up. And the Conservatives were effectively permitted to purchase the paper’s copyrighted masthead to reinforce that impression. Is that ‘fiercely independent’, as the Observer’s editor in chief Gary Shipton insists? Mr Shipton made his bylined piece about the advertising wrap the most prominent election NEWS story (page two lead of the substantive newspaper) in the final pre-polling edition. In cross-referencing the wrap as a news story, the paper has, (very!) arguably, subjected itself to the IPSO Code on accuracy and right of reply. For example, the Tories’ exhortation to ‘vote Conservative and save Britain from the chaos of Ed Miliband and the SNP in Downing Street’ could be considered inaccurate, unfair and potentially libellous in view of Mr Miliband’s oft-repeated insistence that there would be no coalition, deal or any other power-sharing arrangement with the SNP. In my view, the Observer fails this yardstick. Then again, I am, unashamedly, both old and ‘old school’. . .
PS: Substantially larger than usual piles of unsold ‘Vote Tory’ edition Observers in my local newsagents last week.